The Gaines' are partnering with Discovery, Inc. 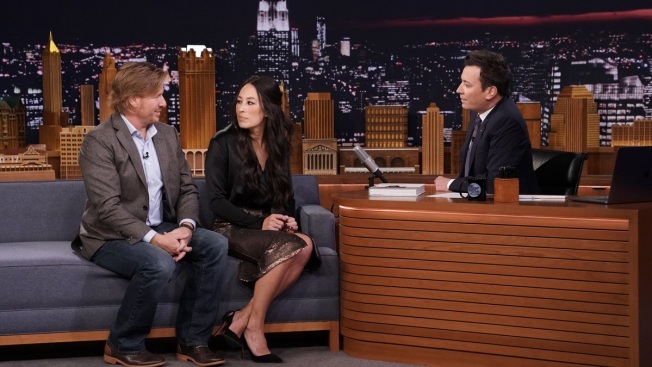 Authors Chip Gaines and Joanna Gaines during an interview with host Jimmy Fallon on November 9, 2018. Chip Gaines and Joanna Gaines are returning to TV and taking the Oprah route. The two announced on Friday that they are returning to television with their own TV network, a partnership with Discovery, Inc. The news comes seven months after their hit show Fixer Upper ended its five-season run on Discovery-owned HGTV, which allowed them to focus on their multiple businesses and their family. Amid their hiatus, Joanna gave birth to their fifth child, son Crew. "We signed a non-disclosure and it said, 'You can tell your mother but that's it.' So Mom, I just wanted to make a quick announcement. We are coming back to television," Chip said on The Tonight Show Starring Jimmy Fallon. "You're gonna get to see the kids grow up. You'll get to see us, obviously, in maybe a six-month delay like the rest of the world, but we're excited to be back." "We've partnered with David Zaslav and Discovery, we're actually gonna have a network and I think we're gonna really carve it out in a way that really makes sense to us and our family," he continued. "It's gonna be filmed a lot in Waco, Texas, so we don't have to travel a whole lot." "Discovery is thrilled to confirm that we are in exclusive talks with Chip and Joanna Gaines," the media company said in a statement to E! News. "The Gaines' are exceptional people, true authentic storytellers and creative visionaries who will nourish millions of people with quality, family-friendly programming accessible on a 24/7 network and across all screens. Stay tuned...working out the final details...more to come soon!" Chip also said on the Tonight Show, "I'd say after five years, we really realized we really wanted to take a step back and just kind of really focus on our marriage. Focus on our family and just kinda catch our breath, you know." "Have a baby," Joanna said. "Well, as soon as we decided to stop Fixer Upper, we had a fifth baby," Chip said. "So we kind of figured out the Rubik's Cube here. It's like time on our hands equals additional children. So we're essentially looking for a part-time job to keep us busy." Last year, after announcing season five of Fixer Upper would be the show's last, Chip remained coy when asked on the Today show if he and Joanna would ever do another show. He later joked on E! News' Daily Pop, "It would have to be a show where it would be me, just all by myself--that could be a thing that I would be interested in."